The sandpiper birds oil painting is still on my easel but I am just about finished. This painting is a horizontal canvas that is 8 inches high and a length of 24 inches. This format is perfect for these little birds that run along the waves at the beach. If you are interested in purchasing this painting send me an email below and it will also be available for purchasing on the seascapes pages of the website. The sandpiper birds oil painting started as a simple outline of the birds as you can see in below in the previous stages of the painting. My goal was to have texture in this beach painting. When I am at the beach I notice all the different textures from the variety of sand to the foamy water of the waves. I continue to glaze over the painting with more detail as I work on the original sand piper bird painting. Going back further in the early stages of this original oil shows the orange background. And the start of the painting where you can see the texture on the canvas. Below is a closeup where the variety of textures can be seen. 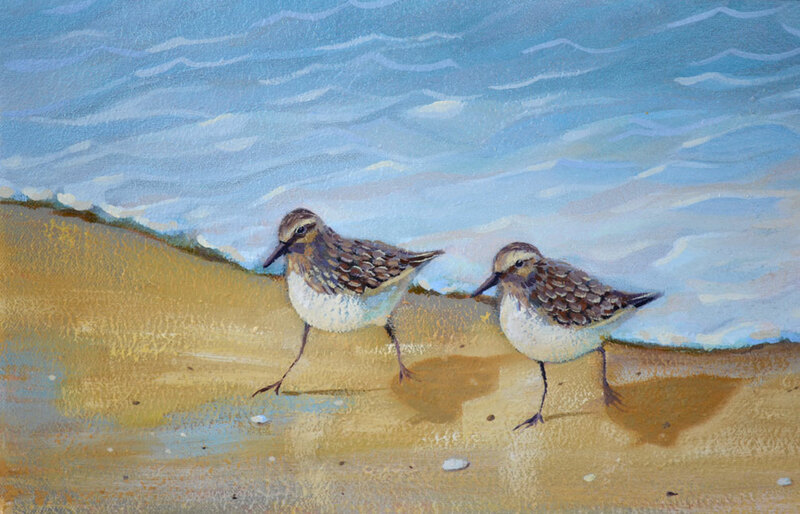 NextSandpiper Birds Oil Painting Update! Sandpiper Birds Oil Painting Update!